Clockwise from top left, Khum Bahadur Khadka, Ganesh Lama, Parashuram Basnet, Man Bahadur Tamang, Deepak Manange and Raju Gorkhali. KATHMANDU, OCT 17: The entry of gangsters, mafia types and the corruption-convicted in competitive politics has drawn a huge backlash, with many from within and outside the political parties demanding an end to the practice of fielding individuals with criminal backgrounds in the elections. The calls to keep politics out of the clutches of criminals come at a time when the major parties are bending over backward to recruit criminals into their parties, a perfect recipe for the criminalization of politics. Nearly a dozen individuals with a criminal background are confirmed to get tickets for the provincial and parliamentary elections slated for November 26 and December 7, while around a dozen more have been lobbying for tickets. 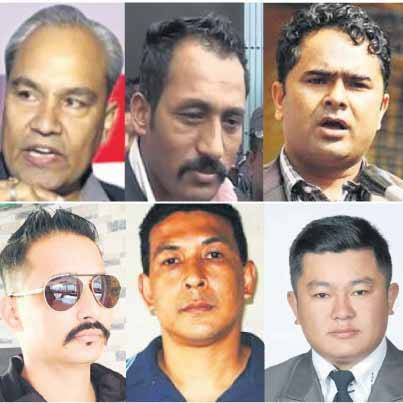 Known gangsters Deepak Manange, Ganesh Lama, Raju Gorkhali, Parshu Ram Basnet and Roj Rana are among over a dozen candidates with a criminal background who are almost certain to contest the upcoming provincial and parliamentary elections. All of them face charges of amassing property without legal sources, abduction, hooliganism and the like. Manange and Basnet have already been nominated for tickets from UML. 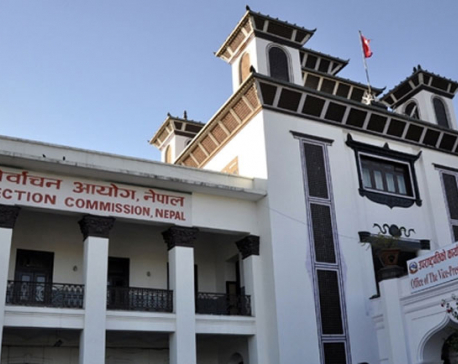 Lama and Rana are seen as favorites for NC tickets for provincial polls, according to NC leaders. Lama, who was previously in the Bijaya Gachhadhar-led Nepal Loktantrik Forum, entered NC on Monday together with the party's leaders. He was welcomed into the party by NC President Sher Bahadur Deuba. NC is also planning to field Man Bahadur Tamang and Sunil Sharma in the upcoming polls. Tamang is an accused in a case concerning the smuggling of 88 kilograms of gold, while Sharma, a medical entrepreneur, has been accused of forgery. Raju Gorkhali, who faces a murder charge, has been nominated under the proportional representation category from Rastriya Janata Party, according to party leaders. "His name has been recommended but it doesn't necessarily guarantee that he will be appointed. The leadership is under pressure not to field any outsiders as that would put the party in a negative light," said an RJPN leader. Party leaders said gangsters are being promised tickets in anticipation of the money and muscle they can bring into play in the elections. The link between crime and politics is not new to Nepali politics. Politicians have long benefitted from the criminal money and muscle brought to bear in return for political protection. But this is the first time that people with criminal backgrounds are joining mainstream politics in droves. Party leaders said gangsters pay far more into party war chests than businessmen, also fund the parties. The growing infiltration of gangsters in politics alongside the rising influence of corrupt politicians is causing huge public anger in mass media and social networking sites. They claim that it is likely to pose a serious challenge to good governance and rule of law. It is also likely to boost the morale of criminals and hamper police efforts to enforce law and order. "Dipak Manange, the gangster, to run for polls as an MLA representing UML. Political parties are extending patronage to criminals. We the people are doomed," Binod Dhakal tweeted expressing frustration at the entry of Manage into UML. Several NC old-timers including corruption convicted Khum Bahadur Khadka and corruption-accused Govinda Raj Joshi are also planning to contest the elections. Many from within and outside the party have been voicing concern over the new trend and questioning the commitment of the political leadership to keep politics out of the clutches of criminals. Such pressure is doing little to stop criminals from entering party politics, largely due to the half-hearted response of the leadership, said second rung leaders of major parties. "Who else do you expect to be contesting from Manang if not Manange?" UML Chair KP Sharma Oli reportedly quipped when reporters questioned him about UML's decision to field Manage from Manang.